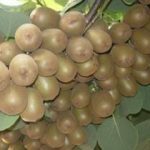 Kiwi fruit plants are also known as Chinese Gooseberry. The fruit is borne on a vigorous deciduous twining vine. Kiwi Fruit plants need to grow on some sort of support – either a trellis or pergola or fence. Two vines are needed for pollination – a male and a female. We sell Kiwi Fruit plants as the set of two.